Sharm ash Shaykh (Sharm el Sheikh), Egypt - Naama Bay, Peace Rd. Welcome to our new apartments in Sharm el Sheikh, located less than 1 km from Naama bay the center of entertainment in Sharm el Sheikh. There are four 60 sq meters flats (1 bed room) + living room and two 120 sq meters flats (2 bed rooms) + living room. Each flat has one bathroom with hot water In each bedroom, there is ample space for clothes and all your belongings. The western, fully equiped kitchen has marble, a brand new fridge and a gas stove and oven. Contemporary architecture, built in a compound with a large swimming pool, only minutes away from the centre of Naama Bay and its beaches. It is secured 24 hours. Special prices offered depending on number of persons. 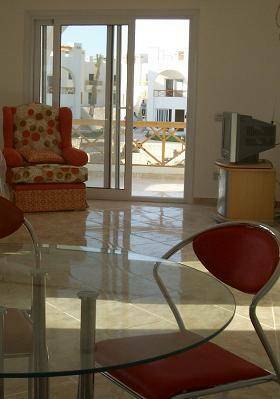 The flats are within easy reach of many beautiful beaches in Naama Bay and close to a shopping centre and the shopping malls of Naama Bay. A Cinema and a Casino are just two minutes away. 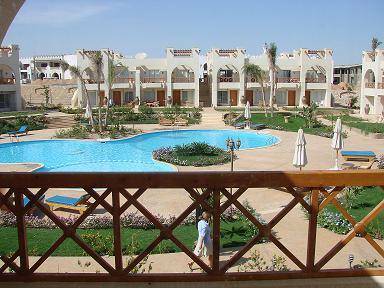 These flats are the perfect location for your holiday in the South Sinai. 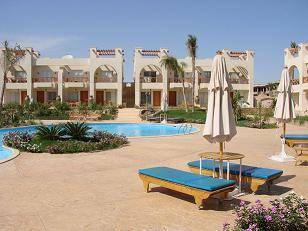 Surrounded by the beautiful Sinai Mountains and the Red Sea, these flats feel like a small luxury resort. The flats are built in a 24 hour secured compound and built around a swimming pool which allows proper swimming with its 14 meter length. The flats offer a comfortable and cosy living area with a beautiful roof top and offer pool views from the living area and balcony. The flats are built in a very open and bright modern style. The furniture is modern and also in light colours. It features a spacious living and dining room opening to the pool terrace and the landscaped garden and sits 2 - 4 persons at one table. The gorgeous pool area includes 6 Loungers with cushions and each flat has 1 outdoor table available in the garden with 2 outdoor chairs. Sun umbrellas make relaxing at the pool even more perfect. The compound in where the flats are located is not far from the main road. There are microbuses who bring you in 5 minutes to Naama Bay or in 15 minutes to the old town Sharm el Sheikh. Taxi services are also easily available. 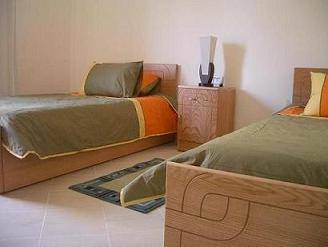 you will be staying in a quiet area but very close to beaches and nightlife. Within a few minutes drive there are several beaches, great local and international restaurants, 5-star resorts, local and western markets, banks with ATM, pharmacies, bakeries, small supermarkets, Egyptian museum. Casino, bowling centre, gyms, thai massage salons, local and just enough night life including live music. Additionally there are many diving schools, quad centres, camel riding, desert trips and a horse riding centre. Organised excursions can be arranged in our office. Take a trek to the top of Mount Sinai to see the sun rise, a never to be forgotten experience, then visit St Catherine's monastery reputedly the site of Moses burning bush. Ras Mohamed national park offers you fantastic coral formations and marine life. Trips can be arranged to Cairo and Luxor to experience this fascinating country. We will be happy to help you booking your trips. There are four 60 sq meters flats (1 bed room) + living room and two 120 sq meters flats (2 bed rooms) + living room. Each flat has one bathroom with hot water In each bedroom, there is ample space for clothes and all your belongings. The western, fully equiped kitchen has marble, a brand new fridge and a electric stove and oven. The flats are built in a very open and bright modern style. The furniture is modern and also in light colours. It features a spacious living and dining room opening to the pool terrace and the landscaped garden and sits 2 - 4 persons at one table. The gorgeous pool area includes 6 Loungers with cushions and each flat has 1 outdoor table available in the garden with 2 outdoor chairs. Sun umbrellas make relaxing at the pool even more perfect. Less than 2 weeks prior to arrival: 100% of total rental rate. 200 security deposit payable the day before arrival, refunded within two weeks of departure less breakages and damages.